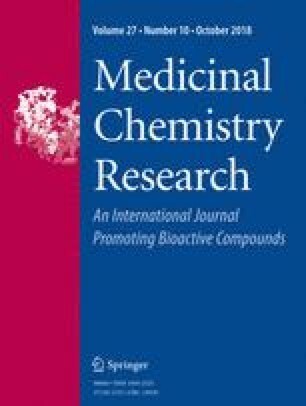 Four new glyco-conjugated tacrine derivatives, 4-(2,3,4,6-tetra-O-acetyl-β-D-glucopyranosyl)-1-(1,2,3,4-tetrahydroacridin-9-yl)thiosemicarbazide (1), 4-(2,3,4,6-tetra-O-acetyl-β-D-mannopyranosyl)-1-(1,2,3,4-tetrahydroacridin-9-yl)thiosemicarbazide (2), 2′-(1,2,3,4-tetrahydroacridin-9-yl)hydrazono-3′-(2,3,4,6-tetra-O-acetyl-β-D-galactopyranosyl)-1′,3′-thiazolidin-4′-one (3) and [2′-(1,2,3,4-tetrahydro-acridin-9-yl)hydrazono-3′-(2,3,4,6-tetra-O-acetyl-β-D-glucopyranosyl)-4′-oxothiazolidin-5-yliden]acetate (4) were synthesized and their characteristics were investigated. All of the novel derivatives were found to inhibit acetylcholinesterase obtained from Electrophorus electricus at a magnitude of one order less than that of the control tacrine. Derivatives 1–3 were found to be nontoxic towards human neuroblastoma SH-SY5Y cells, while compound 4 was markedly cytotoxic against these cells (IC50 value 2 µM, 72 h). These differences in cytotoxicity were examined further by investigating the uptake and intracellular localization of the tacrine derivatives. Non-cytotoxic derivatives 1–3 were found to localize outside of the nuclei, showing a marked preference for the lysosomes and the mitochondria; in contrast, the cytotoxic derivative 4 was localized in the nuclei of the neuroblastoma cells. Interaction studies revealed that derivative 4 displays a high affinity towards DNA, and also provided evidence of the compound’s ability to inhibit Topo I. A correction to this article is available online at https://doi.org/10.1007/s00044-019-02326-4. This work was supported by the Slovak Grant Agency VEGA, Grant nos. 1/0001/13 and 1/0790/14, KEGA 002UPJŠ-4/2015, UHHK 00179906 and Structural Funds EU (ITMS: 26240220071).